Berlin Subscription Update 2 - Anniversary Edition consists of new features, enhancements and bug fixes. Update 2 requires a full uninstall and reinstall. Available to customers with an active Update Subscription. Bring your existing Windows Desktop applications to the Microsoft Windows 10 Store using the Desktop Bridge technology, also known as Centennial Bridge. This is a new technology in the recent Windows 10 Anniversary Update. 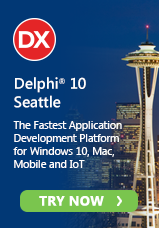 RAD Studio offers direct support in the IDE to easily create APPX files for the Windows App Store, with included deployment support, integrated code-signing support, and the ability to add your own app store icons and configure other elements of the application. New in Update 2 are two new calendar components designed for Windows 10. These new VCL UI controls mimic the WinRT UI controls while providing support for older versions of Windows. TCalendarView provides month, year and decade views, and the ability to select date ranges with animated transitions when navigating between views. Fully supports VCL styling using existing and newly included Windows 10 styles. TCalendarPicker provides a single date selector drop-down menu for your application. Fully supports VCL styling using existing and newly included Windows 10 styles. 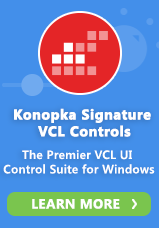 Quick Edit allows you to quickly perform common actions in the VCL form designer. The main Quick Edit operation, available for all components, opens the Quick Edit pane allowing users to rapidly modify the name, caption, alignment, layout, and color of a control (if applicable to the control). Additional operations allow copying the component name, editing the images part of a control, and binding the control to a data source or a data field. Update 2 includes the following Windows 10 FireMonkey styles: Win10ModernSlateGray.Style, Win10ModernPurple.Style, and Win10ModernGreen.Style. Update 2 includes the following Windows 10 VCL styles: Windows10SlateGray.vsf, Windows10Purple.vsf, and Windows10Green.vsf. This update also includes additional enhancements throughout various product areas and fixes for over 100 publicly and internally reported bugs.